"My collection [is] far superior in both number & beauty & I might add interest, to that of any other collection in the world...," Wilson A. Bentley. For over forty years, Wilson "Snowflake" Bentley (1865–1931) photographed thousands of individual snowflakes and perfected the innovative photomicrographic techniques. His photographs and publications provide valuable scientific records of snow crystals and their many types. Five hundred of his snowflake photos now reside in the Smithsonian Institution Archives, offered by Bentley in 1903 to protect against "all possibility of loss and destruction, through fire or accident." Wilson A. Bentley was born in 1865 in Jericho, Vermont. Taught by his mother, he lived and worked on his family farm located in the "Snowbelt," where the annual snow fall was about 120 inches. From the time he was a small boy, Bentley was fascinated by the natural world around him. He loved to study butterflies, leaves, and spider webs. He kept a record of the weather conditions every day and was fascinated by raindrops. Bentley developed an interest in snow crystals after he received a microscope for his fifteenth birthday. Four year later, in 1885, equipped with both his microscope and a camera, Bentley made the first successful photograph of a snowflake. Bentley was a pioneer in "photomicrography," the photographing of very small objects, especially of snowflakes. Snowflakes or snow crystals are difficult to photograph because they melt so quickly. 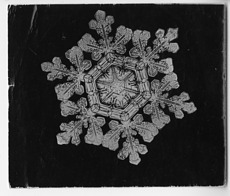 However, Bentley developed the equipment and techniques to take photographs of individual snowflakes. After many failed attempts at drawing the details of the snowflakes, he connected his camera to a microscope in order to create photos that showed intricate details of each snow crystal. Bentley stood in the winter cold for hours at a time; waiting patiently until he caught falling flakes. Once a snowflake landed, he carefully handled it with a feather to place it under the lens. The apparatus was set up outside so that the delicate specimens would not melt, and after a minute and a half exposure, he captured the image of a snowflake. From that first photograph in 1885, Bentley photographed more than 5000 snow crystals until his death in 1931. From gathering this large collection of snowflakes, Bentley learned that every single snowflake was unique and in the year of his death he, along with William J. Humphreys, a physicist with the US Weather Bureau, published these findings in Snow Crystals, a volume containing 2300 of his photographs for all to study and enjoy. Throughout his life, he also published 60 articles in various scientific and popular journals. While most of his articles discussed snow crystals, he also photographed and wrote about frost, dew, and other atmospheric phenomena. In 1904, he donated a collection of 500 of his snowflake photographs to the Smithsonian Institution to ensure their safety. In his correspondence with the Smithsonian Institution's third Secretary, Samuel Pierpont Langley, Bentley offered positives and slides of his photos, writing that he was "deeply grateful for your [Langley's] kindly help in thus placing my collection of snow photographs beyond all possibility of loss and destruction, through fire or accident." At that time he also sent a copy of a previous publication on the snow crystal photographs. Later he sent a lecture he had given at the Brooklyn Institute of Arts and Sciences in 1905, intending for it to be edited and published by the Smithsonian, though it never was. His photographs remain in the Smithsonian Institution Archives, safeguarded from any misfortune. Bentley remained in Jericho, Vermont throughout his life. Ever dedicated to his work, he died there in 1931 after having caught pneumonia from walking through a blizzard. Bentley, Wilson A. "Studies among the snow crystals during the winter of 1901-2 with additional data collected during previous winters and twenty-two half-tone plates," In Annual Summary of the Monthly Weather Review for 1902. Washington, DC: Government Printing Office, 1903. Bentley, Wilson A. "Photographing Snowflakes." Popular Mechanics 37 (1922): 309 – 312. Bentley, Wilson A. "Conical Snow." Science 75 (1932): 383. Bentley, Wilson A. "Glories of the Dewdrops Caught by the Camera." New York Times, July 31, 1927. Bentley, Wilson A. "Jack Frost Designs Jewels of His Own." New York Times, February 19, 1928. Bentley, Wilson A., and William J. Humphreys. Snow Crystal. New York, NY: McGraw-Hill, 1931. Blanchard, Duncan C. The Snowflake Man: a Biography of Wilson A. Bentley. Blacksburg, VA.: McDonald & Woodward Pub., 1998. Fritts, Mary Bahr. My Brother Loved Snowflakes: the Story of Wilson A. Bentley, the Snowflake Man. Honesdale, PA: Boyds Mills Press, 2002. Martin, Jacqueline Briggs. Snowflake Bentley. Boston, MA: Houghton Mifflin Company, 1998. Prior, Douglas. 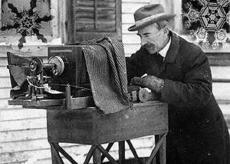 Wilson A. Bentley, 1865 - 1931: Photographer of Snow Crystals. Tempe, AZ: School of Art, Arizona State University, 1984. Stoddard, Gloria May. Snowflake Bentley: Man of Science, Man of God. St. Louis, MO: Concordia Publishing House, 1979. Thone, Frank. "Every Snowflake a Unique Jewel." The Science News-letter 21 (1932): 90-92. Jericho Historical Society's Snowflake Bentley Website. Bentley Snow Crystal Collection of the Buffalo Museum of Science. Kapsalis, Effie. "Crafting The Archives Way!" The Bigger Picture (blog), Smithsonian Institution Archives Blog, December 8, 2010.